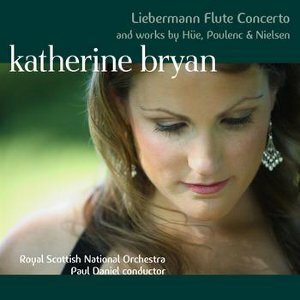 The Royal Scottish National Orchestra are clearly proud of their flautist Katherine Bryan. She was appointed to the principle chair with the orchestra at the age of only 21 in 2003, and even seven years down the line, her talent still seems precocious. The programme on this disc is varied, all the better to show of the many facets of her playing: her range of timbres, her flawless passage work, and (particularly in the Nielsen) her ability to switch between moods and styles at a moment's notice. The Liebermann Concerto gets top billing, but I'm not sure why. The work is in a very populist American style, like John Williams' film music but without the memorable tunes. There now seems to be about half a century's worth of American concertos for wind instruments in this insipid pseudo-Romantic idiom, and I have to say I find most of it pretty vacuous. But aesthetic ideology aside, it does what it sets out to do, namely to showcase the emotional and technical capabilities of the flute and the flautist. Liebermann opts for a large orchestra, but is careful with the balance and makes sure the soloist is never subsumed. That does often require Bryan to play loudly for extended passages, and her tone sometimes suffers, taking on a hard edge that is ok in small doses but can get tiring. Were it up to me, I'd have programmed this CD in reverse order, because as it goes on the music just keeps getting better and better. The George Hüe Fantasie is slightly insubstantial but is still far more rewarding than the Liebermann. Debussy is a clear influence on the Impressionistic textures here, especially in the waves of sound from the orchestra, each with a slightly different instrumental combination. The interplay between the soloist and the woodwind players of the orchestra is very impressive, and wonderfully captured by the SACD sound. The Poulenc Sonata, as orchestrated by the composer's close friend Lennox Berkeley, makes for a convincing concerto. The orchestration is competent but shows some English reserve, and you get the feeling that, had the composer orchestrated the work he'd have been a bit more adventurous. But then, the reserved orchestration allows the work's original character as a sonata to come through. Those long, winding flute melodies are a real joy, and are wonderfully played by Bryan, always precise but never mechanical. The programme ends with the magnificent Flute Concerto by Carl Nielsen. Bryan knows this work well; she got her big break when she won a competition with it at the age of 15. It is a paradoxical piece, both naïve and knowing. A light touch from the flautist is essential, but then so is a rigorous focus on the brief melodic segments and transient tonalities. Bryan negotiates the twisting and constantly evolving solo part well. This is another piece where orchestral tuttis (albeit from a chamber orchestra) often seem to be in competition with the soloist, but this time Bryan's tone is warm and secure throughout. Excellent playing from the RSNO. The Nielsen is the only score with anything for them to get their teeth into, but they make a great job of it. The concerto has one of the great bass trombone parts in the repertoire, and it is given a great reading here, authoritative but with that essential sense of humour. As you'd expect from Linn, the sound quality is of demonstration quality. The arrangement between soloist and label is evidently a fruitful partnership, her impressive tone is the perfect subject for high-end audio reproduction. Add to that the variety of her tone and the sheer musicality of her performance, and the result is a must flute fans and audiophiles alike.